Do I even really need to introduction Alex. If you’ve been on the forums or on the site in the last few months you should all know of his ambitious and eagerly awaited film: Redemption. He’s been out touring the conventions, raising attention for his film and now I’ve captured him for an interview with AvPGalaxy. 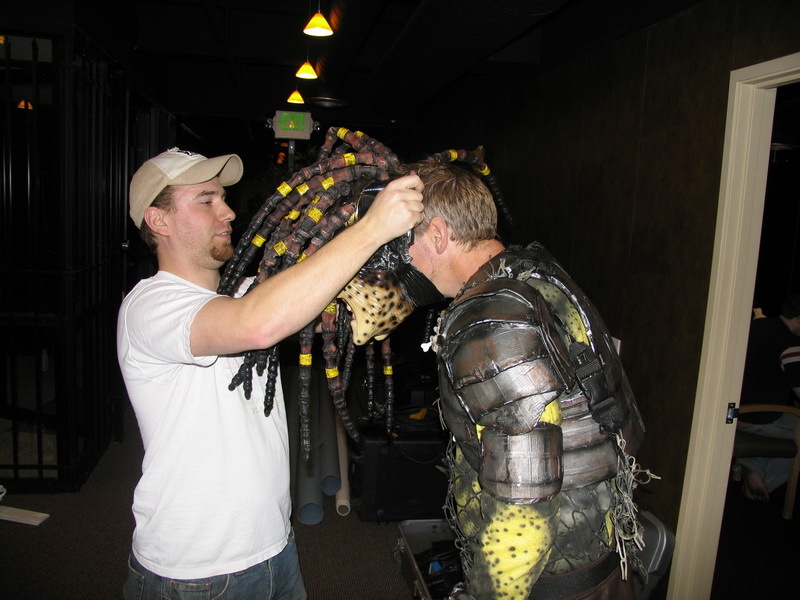 AvPGalaxy – Corporal Hicks here! Long times no interviews! Well this is all about to change. I’m here with Alex Popov, the man behind the upcoming AvP Redemption. 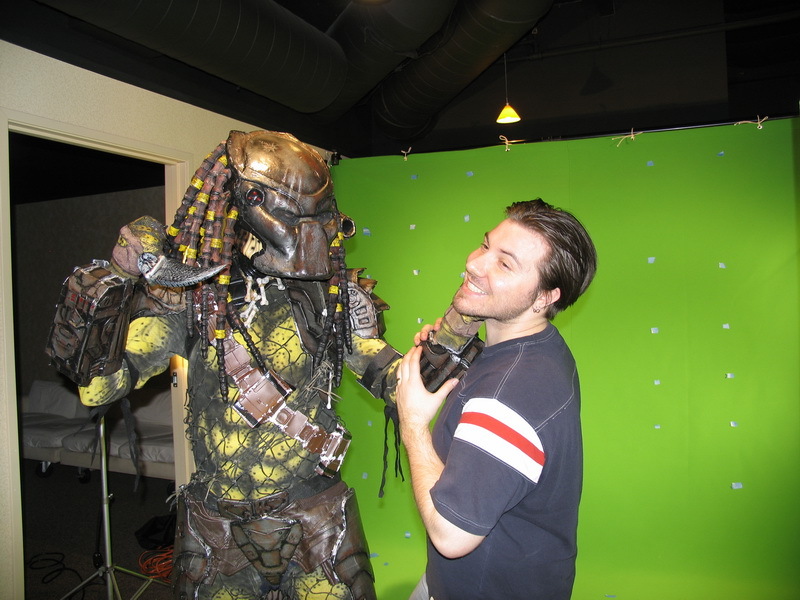 Tell me, Alex, what makes AvP Redemption special compared to all the other fanfilms out there? Alex Popov – Well I think I went an extra mile with this film. The look, the feel, the FX, planning and time I put in to production. I think thats what makes it different . AvPGalaxy – Can you tell us a little of the origin of the project? Where did you get the idea to do a green-screen movie? Alex Popov – It all began when I saw “Batman Dead End”. I decided I wanted to make my own Predator fan film. The next step was making the costume. I did some research on the web about how to make cheap armor and decided to go with cardboard and duck tape. It took me about 2 month to make it and about $200. Lucky for me I finished right in time for Halloween. In 2 days I won about $800 in cash prizes. Eventually I started to think about some storylines and did some test shots. My first test called “Alex Versus Predator”, you can find it on YouTube. Originally I wanted to do all real environments. Maybe in the woods or some construction site, but after a few month playing with Maya 3D and poser I figured I just might give it a try with a green screen. I bought a few pieces of green fabric and scratched it across the hall at work on the weekends and did a few tests. It looked pretty good. After that decided to go with a green screen. So all the scenes on the green screen are shot in the hall way. However some of my friends recently purchased big space in another building and for helping them paint it blue they gonna let me shoot it there. Its much bigger. All the walls and floor will be painted blue. So from now on I’m shooting there. AvPGalaxy – How has Redemption evolved over the course of it’s production? Alex Popov – Its funny ’cause I wanted to make a little short with Boba Fett fighting Predator, just for fun to play with some FX and put my costume to some use. But later on I got a 3D model of an Alien and tried animating it. After a few tests I decided to do an AVP short cause it finally was possible to do. Than it went from a short AVP fight scene to more developing of the story, with more environments and characters. 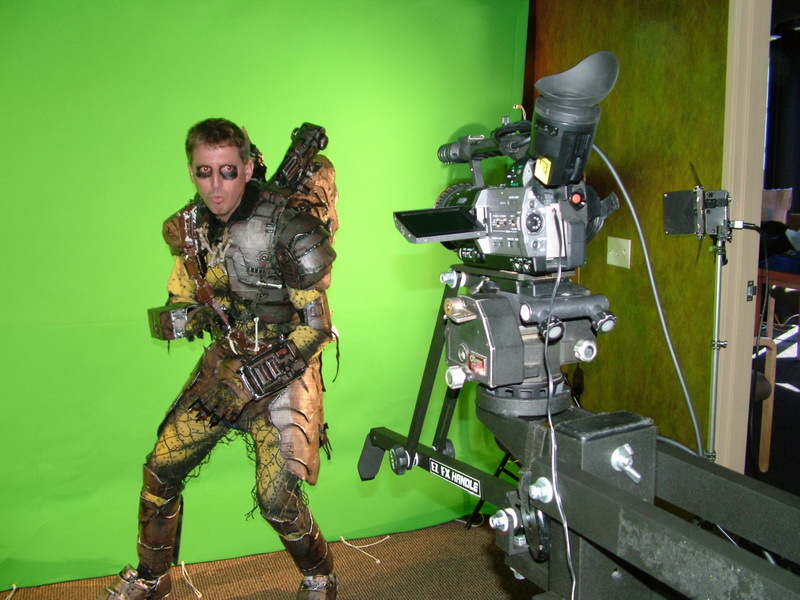 AvPGalaxy – Can you tell us a little about the story of the film? Alex Popov – Well as you all know from the trailer the main action evolves around the abandoned “SULACO”, drifting in space. The ship is discovered by small group of humans and about the same time by an outcast Predator who has been sent to a mission in order to redeem himself. And than all hell breaks loose. The rest is a secret for now. It’s a short film so I can give away only so much. AvPGalaxy – From what I understand a human story wasn’t added to the film until quite late? Why did you decide to include humans in the story? Alex Popov – That’s true. Originally I planned to do only Predator and Aliens film, but thought a human storyline will bring more of an “Aliens” like feel to the film. So hopefully Alien fans will get their fix from it. 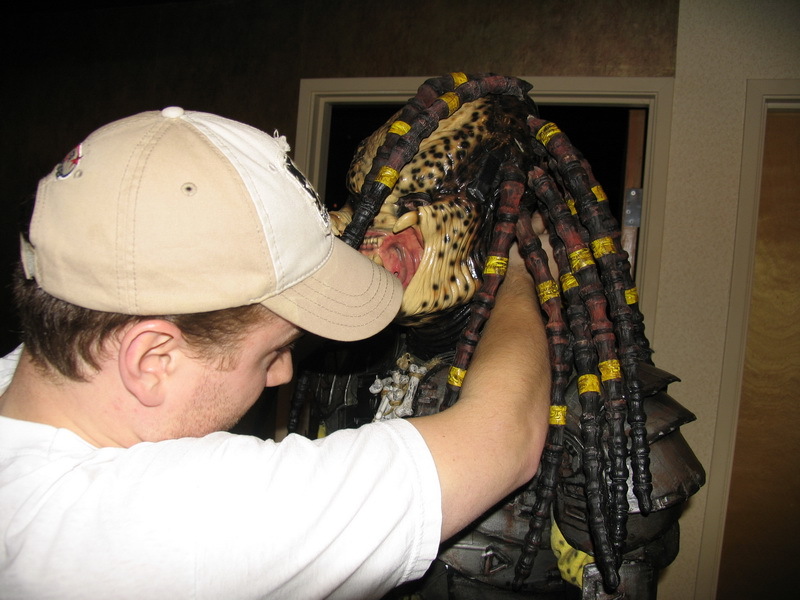 Plus its AVP film so people will expect to see humans in it. AvPGalaxy – From a continuity standpoint, aren’t you worried that by adding elements in later and later you might make the film less coherent? Alex Popov – Not really. I think adding a few new parts will extend the story and explain some questions about the connection between this short and original Alien movies. Plus some of the ideas for the story I took from the comic books and adding few parts will help to connect with the rest of the franchise. However I’m gonna do a 2 versions of the film. The short one will have only Predator and Aliens and the second, the extended, will have an all new opening, human storyline and different ending with hopefully some scenes of Predator’s homeworld. The main reason why is the time it takes me to make it is a lot longer than I expected. Plus fans will have something else to look forward to next year. 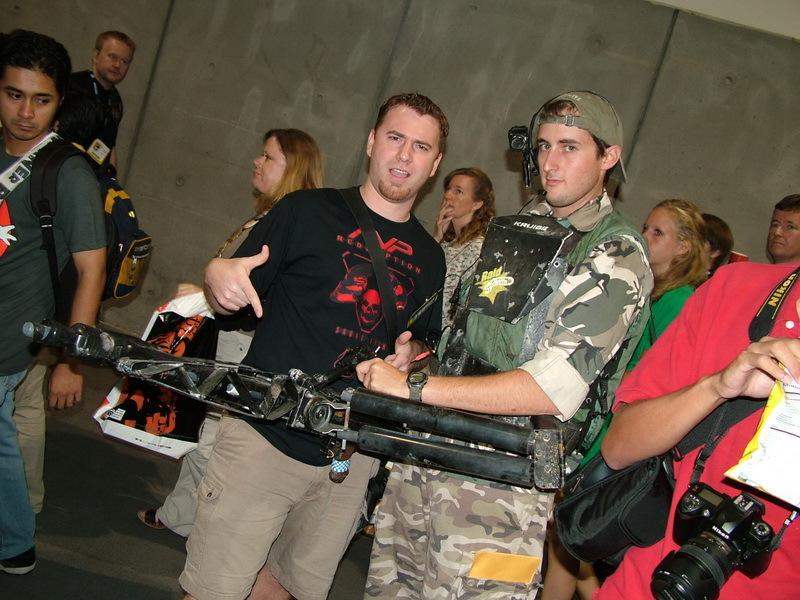 AvPGalaxy – You also went to Comic Con recently. Can you tell us about how you advertised the film there and what happened? 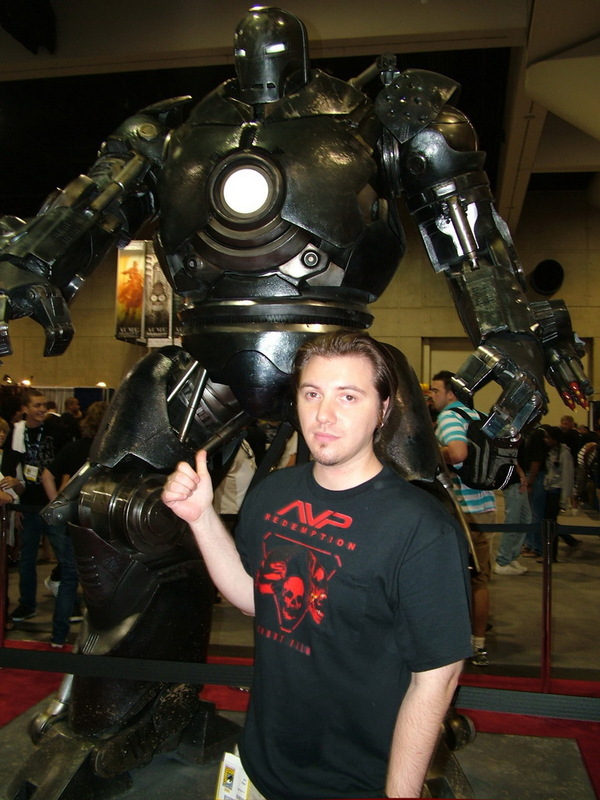 Alex Popov – ComiCon was A LOT of fun. Me and my friend Ryan, who helps me with the film, and one of the actors had a t-shirts that i made with AVPRD logo on the front and cast and crew sign on the back. people were stopping us and asking questions, a lot of them thought it was a real Fox movie, and some were asking where I got this awesome t-shirts. People were giving us their cards with emails and asking to send a link to the trailer and so on. Also we’ve met a group of local guys who had a Colonial Marines costume. I got their contacts and maybe I’ll be able to use them in the film. So over all that was very fun event. 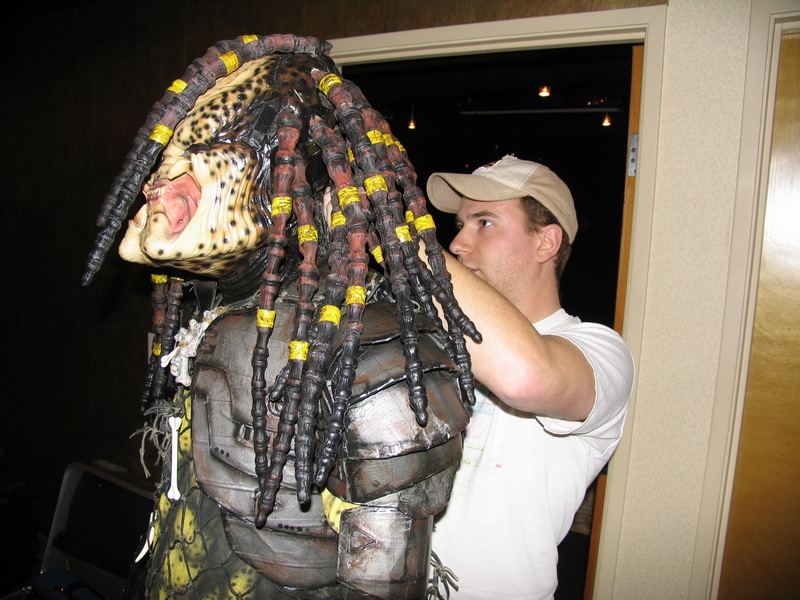 AvPGalaxy – I’ve also heard rumblings of AvP Redemption making appearances at some film festivals. What can you tell us about that. Alex Popov – Not much yet. I know it will be shown around the Europe and some local Sci-Fi and Fan film festivals. I will know a bit more once the film is finished. What I know for sure is I can’t except any cash prizes, it violates the copyright laws. 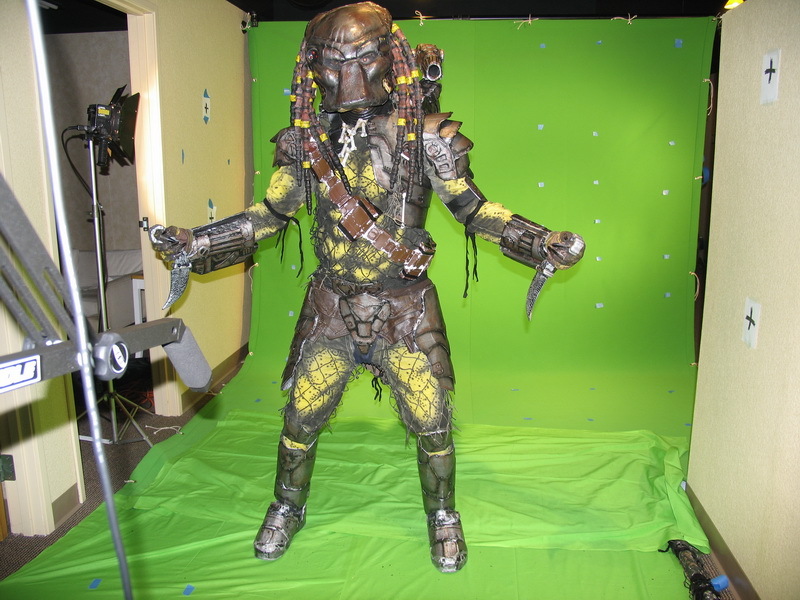 AvPGalaxy – The only practical elements for Redemption are the Predator and humans? 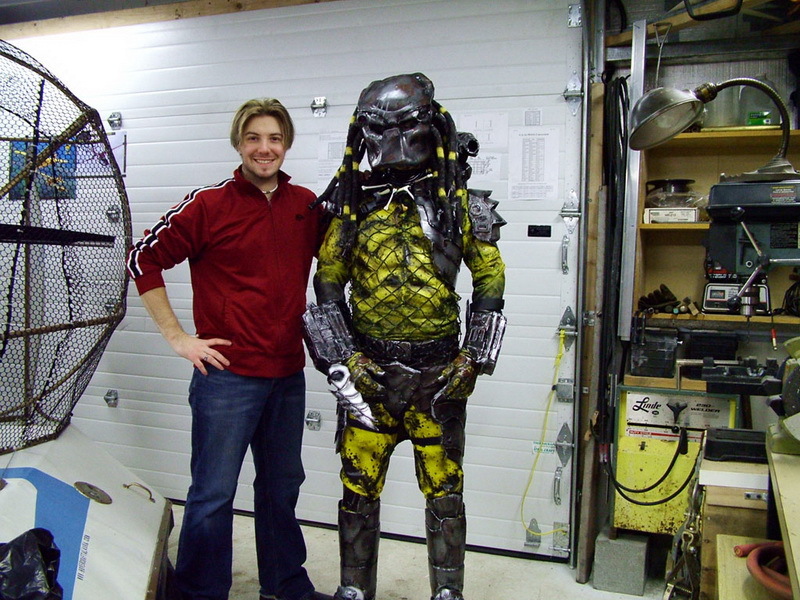 Where did you get that fantastic Predator costume? Alex Popov – As I mentioned before, after I watched “Batman Dead End” I figured that I can make my own costume. I searched for some costume construction web sites and decided to use one of the techniques. My main material was cardboard and duck tape spray, painted in few coats with metallic and black spray paint and than retouched with the brush by hand. The mask was bought on Ebay , its a cheap $50 “Rubies” mask. I had to do a lot of modifications to it, including cutting it in to pieces and gluing it together to make it much smaller, and than repainting it. AvPGalaxy – There are quite a few 3D CGI programs out there. Which do you use and why? Alex Popov – I used “Maya” for environments modeling, “Poser” for animating and rendering the Aliens (free models that I found on the web), “PFTrack” for 3D tracking of the shots, “After Effects” for the composting and FX and “Premiere” for editing. To learn all of this programs I used mostly tutorials that I found on the web. 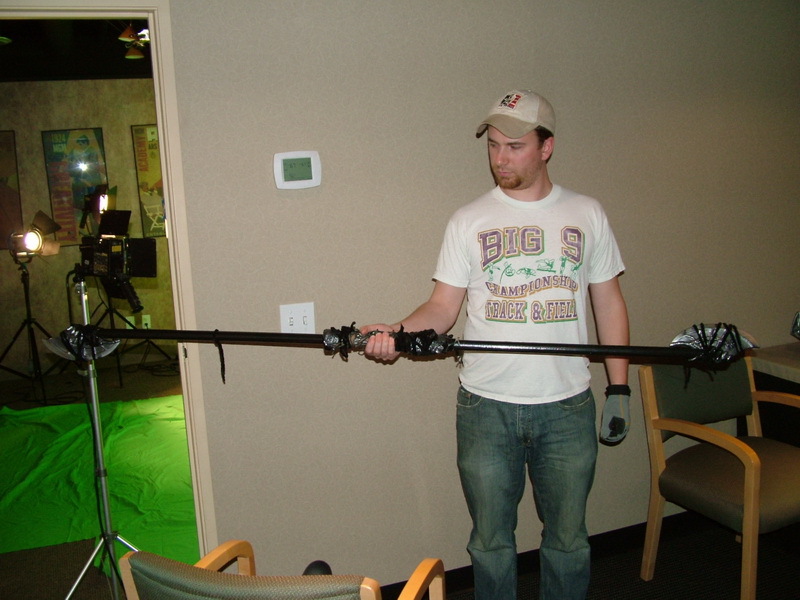 AvPGalaxy – Walk us through the creation of a scene? How do you go from filming against a green-screen to the fantastic looking scenes we’ve been seeing? 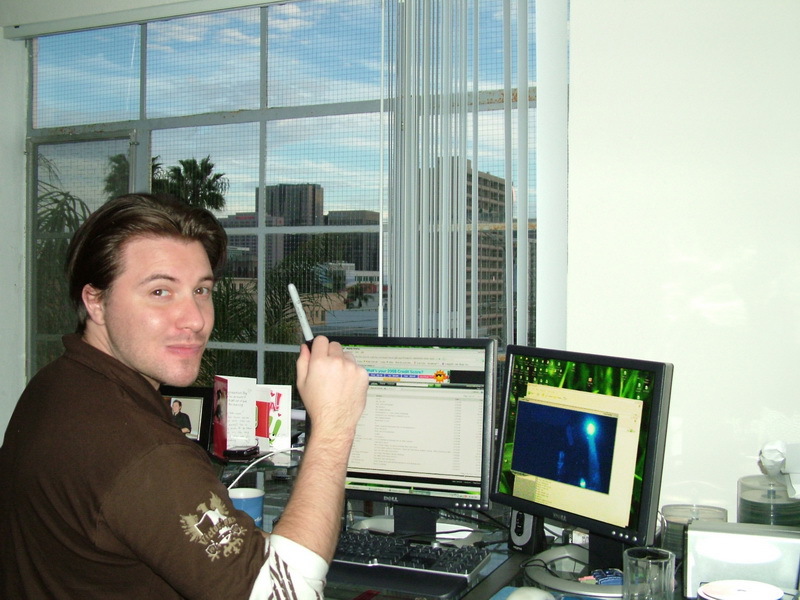 Alex Popov – First I start with very detailed story boarding of the scene. Every second of every shot needs to be thought through and envisioned in my head. We then light up the set to create the right mood and look. I show and explain to my actor what exactly is happening and how to move and react in this scene. We practice a few times and shoot a few takes. At home I digitize the footage into my computer, choose the best shoots, edit the whole scene with a green screen first. Then I go shot by shot and starting to compose it in to digital environments. If the camera is steady its one story, but if it has a pan or a movement it needs to be tracked first, than matched with CG environments. I bring the shot into After Effects, key out the green screen and rotoscope some parts if needed. CG Environments then rendered and composed in After Effects. All the elements are color matched, depth of field, motion blur, CG elements such as dust, steam, sparks or what ever needed added. At the end I put some camera motion, some FX filters such as glow. And then I render the scene. After that I bring it in to Premiere and replace the green screen scene with the finished one. AvPGalaxy – Which would you say was your most favourite location to create and why? Alex Popov – That would be a “Face Huger” lab . I don’t know why I just like it. It’s dark and a very atmospheric place. Plus that scene has some cool revealing pan shots. AvPGalaxy – What was the most difficult thing to create digitally and why? Alex Popov – I’d say Predator’s ship interior, ”˜cause it was the first environments I’ve designed and modelled. AvPGalaxy – On average how long would you say it takes to completely model and render a scene? AvPGalaxy – You’ve put a fair bit of emphasis on the score in the film. Can you tell us a little about why it’s so important to you? AvPGalaxy – You also mentioned you’d been in touch with Fox considering the film? Alex Popov – A lot of people were saying that it’s gonna get “Foxed” (shut down by Fox Studios). That was one of the reason why we decided to contact Fox’s PR departments and let them know what we are working on. Let them know that we are doing it just for fun and not to make any money. So they looked at the trailer, had a little meeting with some guys upstairs, showed them the trailer and said : “It’s cool go ahead and finish your short film, you can enter it in film festivals as long as you don’t except any cash prizes or affiliate your production with Fox Studios”. That’s all I needed to hear! 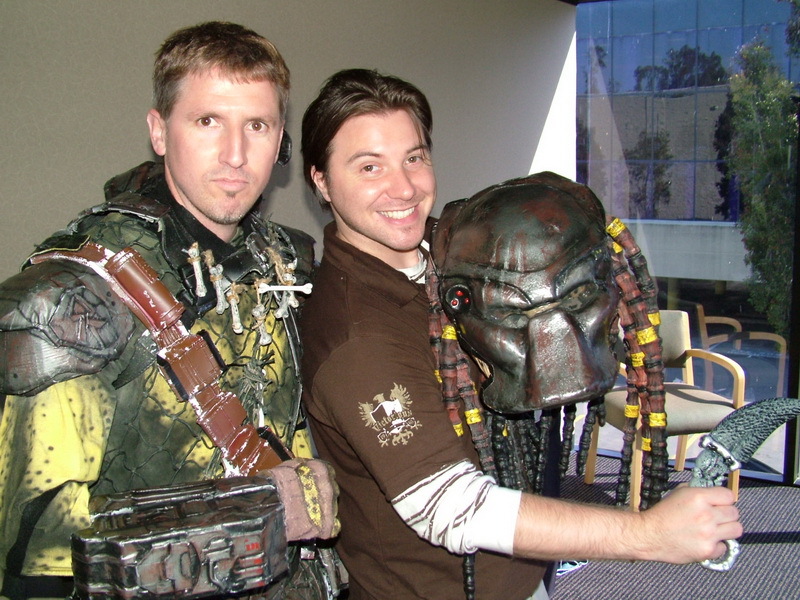 AvPGalaxy – Well, this is Corporal Hicks for AvPGalaxy signing out. Before we go, any last words Alex? Alex Popov – Thanks everyone for your support and input, be patient with me ”˜cause it takes forever to make this film. I hope it will live up to everyone’s expectations. Ohhhh…. and you guys at AVPGalaxy… you ROCK !